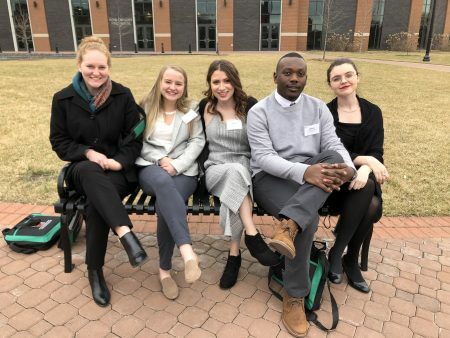 Five Randolph students participated in the Virginia Foundation for Independent Colleges’ (VFIC) 20th annual statewide collegiate Wells Fargo Ethics Bowl this weekend at Roanoke College. The Randolph team competed head-to-head against other highly qualified student teams from Virginia’s 15 leading independent colleges and universities, deliberating a variety of case studies highlighting ethical dilemmas. The members of the Randolph’s student team were Chloe Brazzi ’21, Tywan Haskins ’22, Hannah Overstreet ’20, Marian Small ’22, and Margaret Van Beek ’19. The faculty coordinators for the team were philosophy professor Kaija Mortensen and political science professor Vincent Vecera. Many notable individuals from a variety of career fields including business, law, education, finance, journalism, and others listened to team presentations and offered reactions to the students’ presentations. Founded in 1952, the Virginia Foundation for Independent Colleges is a nonprofit fundraising partnership supporting the programs and students of 15 leading independent colleges in the Commonwealth: Bridgewater College, Emory & Henry College, Hampden-Sydney College, Hollins University, Mary Baldwin University, Marymount University, Randolph College, Randolph-Macon College, Roanoke College, Shenandoah University, Sweet Briar College, University of Lynchburg, University of Richmond, Virginia Wesleyan University, and Washington & Lee University. For additional information on the VFIC, visit www.vfic.org.